We have had storm after storm batter us this winter. Interaction with Ben and Cloud has been limited to dashing out, feeding, distributing hay and dashing back in again, with time made for hoof trimming also. Somewhere in the midst of that Ben has sought me out, making it clear that he wants to spend time with me. Cloud has seemed stand-offish, standing away, approaching only when he sees a bucket in my hand or hay in my arms. So today, a sunny, frosty morning, gave some opportunity to spend time with the boys before this evening’s promised storm crashes in. My agenda: to spend time with Cloud, undemanding time, sitting in a chair wrapped against the cold and showing him that I am non-threatening. I can take my time this morning with my approach with feed buckets and hay. And I see why Cloud is stands off. He is clearly signaling to me that Ben is his. Ben, behind him on the track is looking for a way around Cloud and I, standing in the yard am clearly a threat – a threat to Cloud’s control of his herd. I sense that if Ben were not trying to reach me, Cloud would come straight up for that bucket he sees in my hand. I turn away and wait. They come up, but Cloud is lively, not settling to his bucket and this effects Ben also who moves around. I signal to Cloud to stand by his bucket. I point to Ben to return to his. And they do. And my agenda has changed. Clearly Cloud has reasserted himself over this winter. Managing a herd of two at home I cannot have this. When I am around Cloud needs to know that I am in charge. I am grateful to Carolyn Resnick for coaching she gave me when I had to manage this situation for Ben and Rosie. I distribute hay in the picadero in small piles. They come up and I guard Ben’s pile. Cloud challenges me just once – we have done this particular ritual before quite a while ago. I find myself very relaxed as I move between Cloud and Ben. Cloud moves away to another pile. It is beautiful up there. Cold, fresh with a wind picking up. The hens come to join us. There is a good view in most directions and I can react to the same sounds as Ben and Cloud almost as quickly as they do. As I notice these sounds they relax and return to their hay again. After a while I move to greet them. Ben first, he turns his head as I look at him and I offer him my outstretched hand which he touches gently with his muzzle. Cloud: I look at him, he turns his head and gives my hand a gentle lick before returning to his hay. Here are some photos from our storm-lashed winter. I missed my opportunity to get a rain sheet on Ben but to my surprise and delight, there is no rain scald this winter. His immune system is clearly stronger. Nothing gets a pony excited like food! When Cloud first came to us I was very grateful for all I had learned from Carolyn Resnick about rituals around food. He understood straight away and that made feeding times easy. Yesterday evening I walked down the lane at dusk, a bucket in each hand. The lane is quite sunken and I could hear Cloud above me trotting vigorously on the other side of the hedge towards the gate. Once I was inside with the bucket he danced around, snaking his head at Ben, tossing his head at me, crowding me and, when I told him to stand, turning his back towards me. His energy was up and Carolyn Resnick rituals seemed a long way away. So I put the bucket down, took off my jacket and defined my space. I swirled the jacket in a figure of eight in front of me, hitting it off the ground, giving myself a wide semi-circle and I repeated this again and again and again until Cloud’s dancing confined itself to outside this space. I moved back to reach the buckets and Cloud danced forward again, so I started again. I felt grounded, in rhythm, almost dancing myself as I moved my boundaries out and claimed my space. Finally Cloud responded to my hand signal and I could get the buckets and allow them their feed. And Ben? He had stood calmly outside all of this waiting for his bucket, seemingly not affected by Cloud’s energy at all. As they ate I strode off down the field. How alive I felt, walking it seemed into the full moon that was clear now with the light of the day almost gone. When I stopped all my senses seemed switched on and I could hear, not just birds, breeze and distant traffic but, it seemed, the plants breathing, yes, even the Ragwort, and I felt part of it all. The ponies had finished and Ben moved towards me but Cloud was obviously still excited, backing into Ben and tossing his head. He drove Ben away from me so I stood between them and he stopped and we stood all three of us and I faced Cloud then and, for once, had a moment of connection with him and I felt our differentness and I felt our sameness and we waited there together held in a silent moment of energy under that full moon. Then it broke, they cropped the grass, I crouched down and we were once again two ponies and a human, magic gone, just being ordinary and, you know, that ordinariness is also magic enough. Movements for me: away for a weekend, care of ponies entrusted to another. Movements for Ben and Rosie: confined to the track and to hay on a wintery weekend in a stormy country. When I came home, I drew consolation from evidence of their use of the track as I faced a big skipping out in the evening. Even with hay just left in the stable when I was away, they obviously used all of the track, repeatedly. And the track has stood up well to the heavy rainfall we have had. More movements for Ben, Rosie and I: I decided to let them into grass at the top of the track. 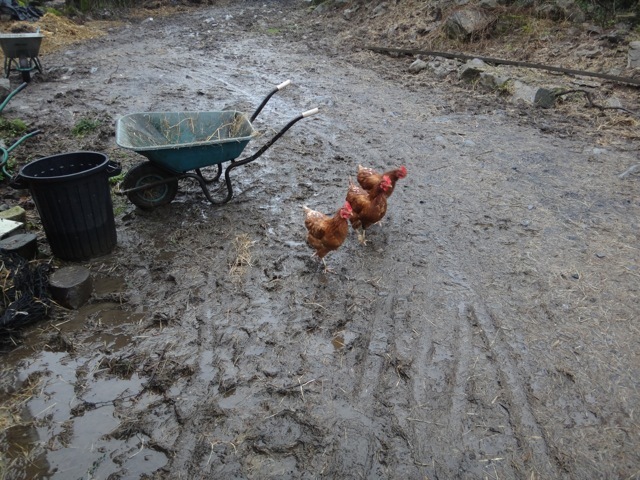 Expecting tea, they were both reluctant to move from the yard. This presented me with an opportunity to lead from behind, which I did, automatically shifting my body position as Ben tried to dodge to the side. He gave in to being herded and was rewarded by fresh grass at the end. There is nothing like the sound of ponies munching grass on a still evening. Ben and I do some work in the picadero. When I am finished I come back to the shed thinking I have not seen Rosie watching us. Oh, there you are! Yes, I should never leave the shed door open when Rosie is around. She found some treats left on the counter which I thought were well earned. Fortunately I had put up the clips on the feed bin lids. Yesterday was one of those mornings when Ben decided he needed to herd Rosie away from me, with that toss of his head that seems to say “game on”. So I decided to herd them both. Round the track we went, Ben charging around first and then settling into a rhythm of a nice steady walk. Rosie is so clever. She knows this is not about her. At any available wider space on the track, she ducks to the side. Poor Ben has to go all around the track to scoop her up again. She ducks out at the next opportunity. Rosie always wins this game. Ben just gives in and walks with me. I am reading Margrit Coates’ Connecting with Horses and in it she speaks a lot about how horses teach humans, if we humans are open to learning. With this in mind, I think about a small interaction Ben and I had this morning. Of course, I being soft bring out two small slices of hay for Ben and Rosie and put them on the ground at opposite ends of the yard area. I had intended to sit and relax with them this morning as a way of re-connecting, but a small challenge from Ben changed this. For he took the hay on the track end of the yard, with his rear end firmly turned towards Rosie, who was waiting further up the track. I wanted a peaceful time with the ponies, so I tried to entice Rosie past Ben. She was having none of this. So I upped my energy and chased Ben off the hay. He barely moved, so I upped my energy again. Eventually he ended at the far end of the yard, watching me, waiting to see if I would leave a gap for him to get through. Rosie had retreated further with all this going on. I felt clumsy in my attempts to keep Ben at that end of the yard, but as we did our little dance, I came into my body and felt myself centering, with my energy all in my core. And as this happened I had to move less and less, barely tipping my hips towards Ben. I also felt energised and as I centered like this Ben relaxed, dropped his head, sniffed out some blades of grass and settled to eating his hay. Rosie had moved up the track and waited. I went to her, leaving the yard to do so. Ben stayed where he was and Rosie followed me to the other slice of hay. It takes a certain attitude to hang out with horses. I think this must be why Carolyn Resnick recommends that you take a book with you when you are ‘sharing territory’ as she terms it. We humans (well this particular one anyway) have such direct-line, focused thinking patterns. I find that even if I mean to chill out up there with the ponies, my mind is hoping for some kind of meaningful encounter. Well, for some reason this evening I went out into the setting sun with a relaxed mind, a mind the equivalent of Sally Swift’s soft eyes, not focused. I did not care if either Ben or Rosie came near me or stayed away. I loved this evening, the evening light slanting through the trees, the relaxed warmth, the sound of ponies munching grass at the side of the track. I sat on a rock. Ben made his way towards me, found a tasty patch, grazed around it, found a tree bough to position himself against for a scratch, a tree trunk for a serious back scratch, some more grass and together I felt we were genuinely sharing territory, my mind as relaxed and present and casual as his. When I got up to move away, Ben followed. I moved slowly, dreamily, stopping now and again. Ben was at my shoulder, his breath warm in my ear, matching my mood, my pace and my halts. I heard shorter, lighter strides behind. Rosie following, part of our herd of three this evening. I was fortunate to have some telephone coaching from Carolyn Resnick a few months ago (a belated birthday present from an understanding husband). I was looking for help with managing the dynamics in my little herd of two. Ben is, was and has always been the boss. Rosie is, was and has always been the bossed. At times like feeding times, Ben would herd Rosie around the haynets, and other times of course when I was not around. I always shut Rosie into the stable to allow her eat her feed in peace but I was not sure if I should interfere in the bossing situation. At other times, if I was sitting in the paddock for example, Rosie would come up to me and be immediately chased off by Ben. I found I was inconsistent in how I responded to this. Well, Carolyn was very helpful, and quite delightful. She summed up lots of good advice with these words which resonated with me at the time: ‘you need to fall in love with that pony (Ben) and show him that he is not the boss of Rosie’. At the time I was definitely feeling not so in love with Ben, although I had not really admitted this to myself. She suggested rituals to help me emphasise that I was in charge of Rosie and pointed out that these rituals are a practice, not a one off. One of the things I have insisted on is that Ben does not boss Rosie when I am around, he does not drive her away from haynets or, as is more likely, prevent her from getting to any haynet. If Rosie comes up to me in the paddock I will not let Ben move her away, I move him away if he does so. Also, when I go up to them for their feed, I always greet Ben and then Rosie before going into the shed. This has worked very nicely for a while now, but just recently, I have no idea how or why, Ben has crept back towards dominance. Give him that inch and he takes that mile. And he can control Rosie so well, just a head turned in her direction will send her away from me. So the other morning, feeding time, Ben would not let me greet Rosie, moving her away and standing very firmly between us. So I upped my energy and sent Ben away with speed. Stand-off. Rosie waited behind me. Ben turned to the side, ears pinned back. I stood, unable to pin my ears back. Simultaneously, so it seemed, we both softened, relaxed, my body relaxed, Ben’s head relaxed, he blew out. Behind me, I heard Rosie step, very softly, towards me. I did not turn to her, just stood there waiting. She came up to my side, and almost tucked her head in under my arm. I felt waves of feelings of safety, of being protected and comforted coming from her. We enjoyed a very beautiful moment together, in the sun, waiting, with Ben outside the shed door, relaxed, soft and quiet.